There are some things you eat at restaurants that never seem to be as good at home. Perfect example: fried green tomatoes. I love them so much that every time I go somewhere and they’re on the menu, I order them. Yet my efforts at home (based, I must admit, on the recipe in the back of Fannie Flagg’s novel Fried Green Tomatoes At The Whistle Stop Cafe) always seemed too soggy and bland instead of the crunchy, spicy dish I loved. With farmer’s market season in full swing, it was time to quit messing around. After all, green tomatoes aren’t exactly available every day, but you can usually find them at a farmer’s market stand. So I went straight to the person who makes my favorite fried green tomatoes: Paul Fehribach, chef and owner of Big Jones in Chicago, a restaurant that specializes in historic southern cooking. His fried green tomatoes, backed by a wonderful spicy remoulade, are to die for. Paul let me visit his restaurant kitchen and get the lowdown on his fried green tomatoes. This man could give a whole seminar on this one dish: No detail is too small to go unturned. To start with, the slice of the tomato: 3/8ths of an inch. “You can slice them thinner, but they might get a bit soggier than that. Fried green tomato, you’re not looking for it to be soft. You want it to have a bit of a bite to it.” Very true. Once the tomatoes are saturated, your all-important step is the dredge. Big Jones uses a combo of white cornmeal and cornstarch, seasoned with salt and pepper. “It really gives you a nice crackly crust. Most vegetables you’re fine using cornmeal by itself, but green tomatoes have a high water content. That cornstarch, buttermilk and hot sauce mixture are going to form like a glass when they hit that oil.” That dredge may seem pretty basic, but as Paul says, “Keep your dredges simple, let your vegetables sing.” Words to live by! Another tip: Before you start the dredging, use your fingers to break up the mixture so it’s not clumpy, otherwise “it’s not going to stick to anything.” It’s okay to keep those tomatoes pretty wet going in, and then “tap around that skin at the edge of the tomato” to help keep the dredge from falling off. Part of my problem with fried green tomatoes is that I always thought you had to use bacon grease (like the novel recipe said), but Paul tells me I’ve been wrong. In fact, at the restaurant, they just fry it in his preferred rice bran oil to keep the dish vegetarian. For our dish he added some “coffee can grease,” like from “the coffee can at the back of the stove where your mom would cook the bacon or the ham.” Granted, considering what his restaurant makes in that kitchen, he probably has the best possible coffee can oil. Now we’re already to the all-important “fried” part of the fried green tomatoes. Apparently, it’s all about heat: “Start on medium-high heat, and once they start to sizzle, I turn it down to medium.” As soon as the tomatoes start to brown (only a few minutes), turn them over in the same order you dropped them in. Securing some green tomatoes from the farmer’s market, I was excited to try this recipe out. I have rarely been so enthusiastic by anything I made in my own kitchen. Even my husband was impressed. I think the key here is the thickness of the tomato slices, tapping the dredge around the edge of the tomato to make a kind of seal, and the heat of the oil. But I’m happy to report that my dish resembled the one Paul made quite a bit. 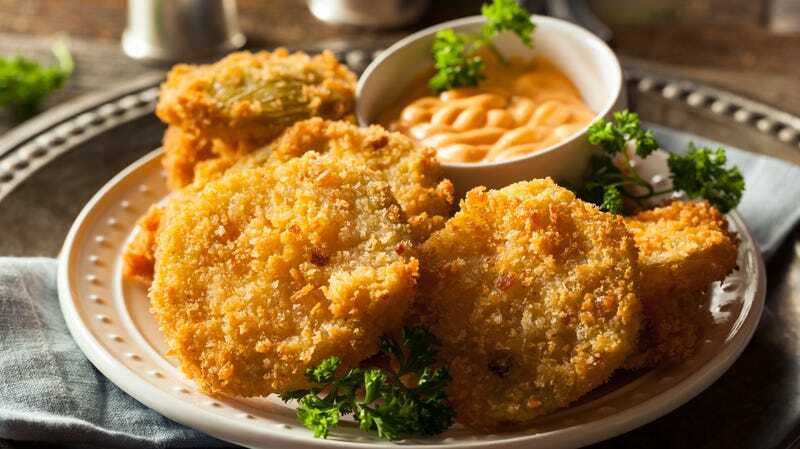 Best of, all I no longer have to wait until my birthday to enjoy the splendor of fried green tomatoes. When slicing the green tomatoes, slice off the very top and bottom. Soak the tomatoes by layering the slices in a mixing bowl. Cover with the buttermilk, add the hot sauce, and move the tomatoes around a bit with a wooden spoon to make sure the buttermilk and hot sauce are dispensed all around the slices. Cover with plastic wrap and refrigerate an hour before frying. In a pie pan, mix the cornmeal, cornstarch, salt, and pepper with a fork until evenly combined, and taste for seasoning. In a 12-inch cast-iron skillet, heat the lard or vegetable oil over medium-high heat, to 350 degrees on a digital clip-on thermometer. Piece by piece, remove the tomato slices from the buttermilk and hold sideways over the bowl for a moment to run off excess buttermilk, but don’t shake—you want to maintain an even level of buttermilk on both sides of the tomato. Lay each tomato slice in the dredge, and turn some dredge over the top of each slice to coat, then gently press into the dredge with your fingers; then turn over and press the other side. Turn sideways and gently tap one edge of the slice to shake off excess dredge. Gently lay the slices in the hot oil in a single layer, leaving a little space between each. You will need to fry two to three batches to cook all the tomatoes. Fry 3 to 4 minutes on the first side, just until the corneal is beginning to brown. We’re not looking for a dark or even golden brown here, or the tomatoes will turn mushy. Gently turn and cook 2 or 3 minutes on the second side, just until crispy. Place cooked tomatoes on a serving plate covered with a clean dry towel to drain, and hold in a low oven while you cook the remaining batches. Place all ingredients in a mixing bowl, and stir with wooden spoon until evenly combined. Cover tightly with plastic wrap and refrigerate for an hour before serving, or up to one week.